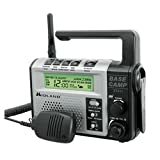 Midland XT511 22 Channel GMRS Emergecny Dynamo Crank Radio with NOAA All Hazard/Weather Alert and AM/FM. The unique XT511 Base Camp Radio from Midland combines communication, emergency notification and information all in one package. The Dynamo Crank will power all the functions of the unit including the LED Flashligh when power is lost or no power is available and can be operated with 4 “AA” Batteries. The XT511 can also be used to charge Midlad GXT Series battery packs or charge cell phones that use a USB connection. The 22 channel GMRS radio features 121 privacy codes, Channel Scan, Hi/Lo Power, and can be used with the included microphone or hands frree with the VOX feature. Stay up to date with the latest weather and hazard information with the NOAA Weather/All Hazard with Alert feature or listen to your favorite AM or FM Radio Station. The XT511 features a Large LCD with backlighting with Clock and Alarm.